Heard of solder paste syringes? But not sure how to use them? Read our guide to solder paste below and learn more about the advantages of solder paste and when you should use it. Solder paste is a mixture of metal solder powder and flux – the two elements required to successfully solder together two pieces of metal. 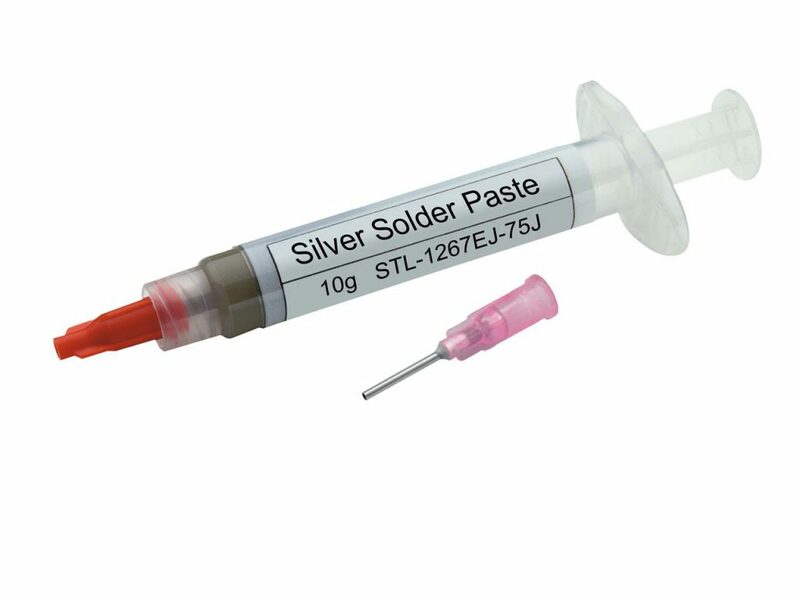 Much like any other form of solder, such as solder strip or wire, you can get solder paste in different types of alloys including silver and gold. You can also get solder paste that melts at different temperatures (hard, medium, easy). Essentially, solder paste is like any other form of solder you can buy – you just have the added advantage of it being pre-mixed with flux. Here’s our step by step guide on how to use solder paste, from the application to heating. One of the best things about using a solder paste syringe is the fact that it comes in a syringe! This makes the application of solder paste incredibly precise – excellent for soldering jump rings together. Simply remove the cap from your syringe and secure the needle that comes with it in place. Reminder: Don’t throw away any of the plastic caps that come with your solder paste syringes. These will come in handy later… read on to find out why! Check that the metal you’re soldering is clean and free from any debris or greasy fingerprints. This can interfere with the soldering process making it much more difficult for your solder to flow nicely through the joint. Make sure that the join you’re soldering is completely flush. File until you can no longer see any light seeping through the join. This will make sure that your solder joint is as strong as possible and help the solder paste flow nicely through the join. Apply a small amount of solder paste to the solder join or area of metal that is going to be soldered. Apply a little pressure to the syringe plunger – you’ll soon get used to the pressure required to apply the tiny amount of solder you need to solder findings. Reminder: Always apply a little more solder paste than you would with pallions, as the solder paste is not purely solder. The flux mixed with the solder will eventually burn off and leave the solder behind. Wipe away any excess solder paste from the syringe and replace the cap. Get into the habit of doing this immediately after each use to maintain the consistency of your solder paste for longer. Now you can apply heat to the solder join in a circular motion. Use the same heating technique that you would use with solder strip or wire – circular motions that heat the entire piece of metal. As the piece of metal gets closer to annealing temperature (glowing a dull cherry red) you can concentrate the heat more specifically at the solder joint. Keep in mind that the flux in your solder paste mixture will bubble and eventually burn off. And as you continue to heat your solder joint you may see the solder itself start to ball up. Don’t worry too much if you find that the solder is not falling completely in the right place. 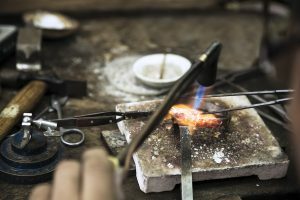 Just remember to focus the heat of your flame towards the join as the solder will be drawn towards the heat. Not 100% happy with the solder join? Simply re-clean your piece, add some more solder paste to the join and reheat using the steps above. Once you’re happy with your solder joint, quench and pickle it to remove any oxidisation. If you find any burrs or bits of excess solder at the joint simply file for a neat, professional finish. Don’t forget you can also explore the essentials of soldering with silver, including information on flux, melting temperatures and more, in our beginner’s guide. What are the advantages of solder paste? The main advantage of using solder paste is the fact that the syringe that it is held in helps you access tiny spaces for accurate soldering. It’s ideal when you’re soldering jump rings or earring posts, or even if you’re thinking about soldering some fiddly detailed metal elements to your latest design. If you’ve worked with solder strip or solder wire before you’ll be aware that once you cut it down into tiny pallions, these can be easily blown out of place as you heat your metal. There’s nothing worse than having a tiny solder pallion jump off your workbench never to be seen again! As solder paste has a different consistency it stays in place much easier than those tiny solder pallions, making soldering small elements much simpler. Remember, however, that using solder strip and wire is essential in some instances. The structural properties of solder strip will produce a stronger solder joint than the paste and will also withstand more heat when soldering larger elements. What’s the best way of storing solder paste? Not planning on using your solder paste for quite some time? Remove the needle from the syringe and reattach the plastic lid. You can also put it in a ziplock bag, that way, there’s less chance of air seeping through the needle and drying out your solder paste. If you use solder paste a lot and store it away for more regular use, organise your solder paste syringes by their melting temperatures. No confusion or fuss as you come to find the right solder paste for your latest project. Is one of your syringe needles clogged? Try soaking it in some warm water to loosen the dry solder paste. And if that doesn’t work, use a thin piece of metal wire to remove the paste completely. Now you know everything you need to use solder paste in your latest projects, you’re ready to perfect the tricky art of soldering jump rings and other fiddly findings.